The last day of the 2014/15 season started off well enough. I had the Mayberry marsh to myself and set up in a spot that had potential. With about a dozen duck and goose decoys spread about, I had a bit of a struggle getting set up in the optimum spot. Cattails and tules complicate hunting at Mayberry. If you sit down against a wall of these tall plants, you can’t see anything until it’s right on you. 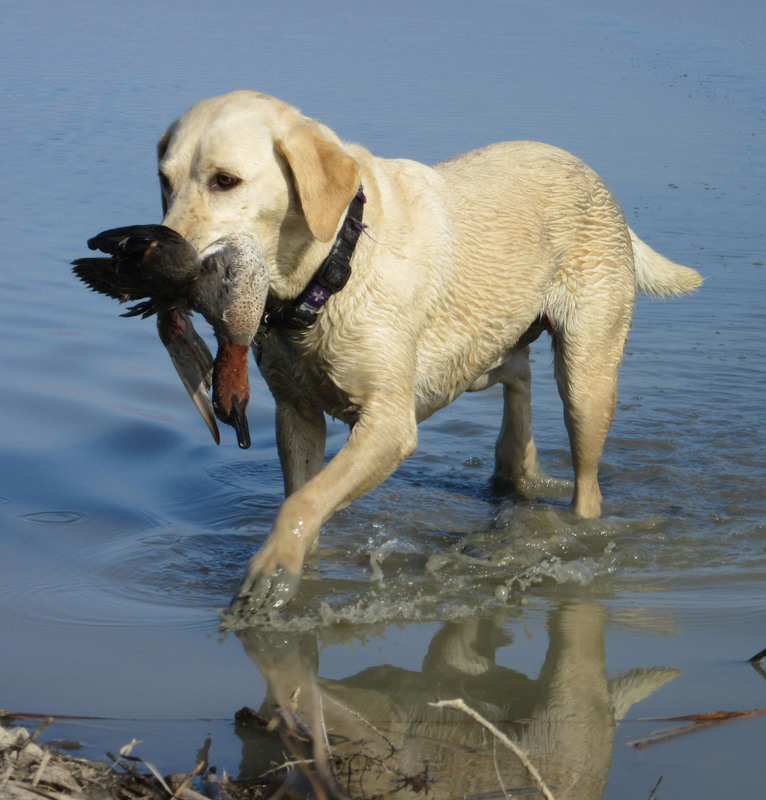 That’s OK if you have the patience of Jobe and the desire to shoot only ducks that are landing. As various ducks passed by me without getting a shot off, I moved several times until I finally commanded a good enough view of the area to see ducks coming. By that time I was in a bit of a frustrated state. Then I proceeded to miss a couple decent opportunities at pintail and mallards. Then I heard a honk, hoonka, hoooawnka…from the field to the north. I reached for my honker call, which I carry on my string of calls for this occasion. Not finding it there, I realized that I’d taken it off to add an additional spec call and resigned myself to silence. Then they appeared, two honkers flying very low and calling. Apparently they could see my three spec decoys because they were heading right at them. I raised my gun to be ready to shoot and got my feet under me so I’d be able to stand. When the birds were about 150 yards out, they began to fade away from me towards the far side of the decoys. It looked like they would pass out of range, so I resorted to the only option left – a mouth honk. It was fairly soft, but the two giant geese heard it and immediately turned right towards me. At 20 yards, I swung past the head of goose one and down he came. The I moved over to goose two with the same result. Goose one was DOA, but goose two was a swimmer. I raised my gun and fired, but the pattern of shot around the bird convinced me that it was futile trying to kill this bird on the water. I hollered, “Lo,” and looked over to see that she was already in pursuit. Realizing that there was a channel between me and the bird, I turned towards my boat. Then the goose disappeared into a band of cattail with Lola in hot pursuit. This was a little scary to me as I had no idea what would happen in a face off between this giant Canada and my dog – a dog that had never (as far as I can remember) retrieved a honker before. I recall another day when a white-front goose had faced off with Lola while standing on dry ground. With wings spread and head erect, that goose had looked intimidating, but to my surprise, Lola ran right over that one. But, this honker was at least twice as large as any spec and Lola was in deep water and thick cattail. Getting into my little 8-foot duck boat was a water rodeo. I could hear Lola barking and growling from the cattail and I didn’t like the sound of this confrontation. Powered by my electric motor, it didn’t take me long to circle to the other side of the cattails from where I could hear Lola growling. There she was, swimming with the goose’s neck in her mouth, all the while growling. I think the sound of her own growling may had helped her generate the courage to tackle the very large goose. She turned the goose over to me and I hoisted both of them aboard the little boat. Lola had the drowned-rat look. Having her back in the boar was a relief. 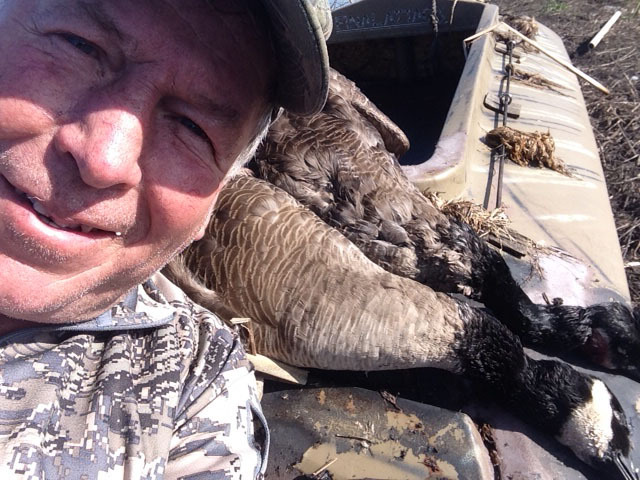 And, the two honkers turned the hunt around. Looks like we’ll soon have some smoked honker breast. You can tell which honker was Lola’s. Note: If you read my previous post, you know that my cell phone later went swimiming with me. However it did take pictures, but it was two days later before it came fully back to life and not before I’d ordered a new phone from Verizon. Since it’s now working again, I guess I’ll send the new one back unused. The last hunt of the season was over. My duck boat and decoy sled were in tow and the rope holding them was in my left hand. My wading stick was in the boat instead of my right hand where I usually keep it. I was riding a high. One more decoy to pick up and the 2014/15 duck season would be complete. One more step….whoops. I had overlooked one thing. I was hunting a lake and forgot that maybe it might be a bit deeper over there. It wasn’t just that it was so deep, but also slippery on the bottom. That last step put my right foot on a slippery slope and down I went – swimming. Wet from head to toe, I reached for the bottom and pushed myself to the surface – getting my feet under me. 1. “Now that was stupid!” was my first thought. 3.”Wonder if it got my cell phone?” was my third. The answers: 1. It sure was. 2. Yes it was salty. 3. Yes it did ruin my phone. 4. Better go to school. Needless to say, I was eager to get back to my truck. That bag of clothes set aside specifically for this situation was a god send. But, the taste of that salt water hung over me on the way home. How salty was it? Was that water as salty as the ocean? This morning curiosity got the better of me and I set out to figure just how salty the water was. I now realize that this is the billion dollar question. My initial efforts to figure this out have produced more information than I’m able to process. So let’s just say that this is fodder for some 2015 research. Hopefully I’ll be able to come up with some meaningful answers. Just enough to clear the fog. In the meantime I won’t be wading without my stick. And, I won’t be calling anybody until after I get a new phone or my current phone decides to start working. Lighting struck twice on the last two weekends of duck season. The last duck of the season for me was a green head that came in with several other mallards about noon on the last day of the season. He was almost directly over my decoys and just in front of me when my shot hit him hard. I called to Lola and she retrieved the bird. I could see the sun glistening off the band as she carried it back to her perch in the cattails. Here’s a selfie of me and the banded bird. Last days are often eventful and this one was for sure. 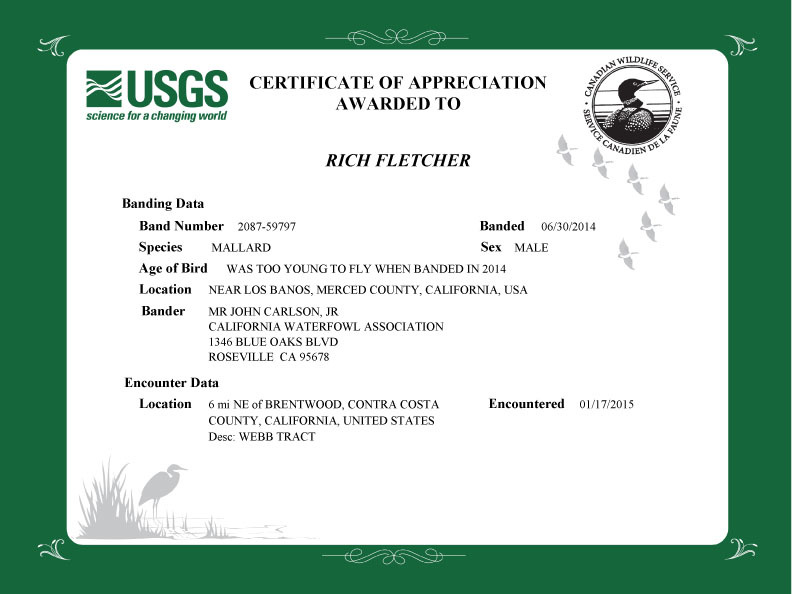 The bird was banded near Tulelake in July 2014. It hatched in 2013 or earlier. This is the second time I’ve ended the duck season with a banded mallard as the last bird taken. In case you haven’t seen one of these, here it is. This mallard was “encountered” last Sunday. Always nice to find a bonus on your bird. Took this photo from my car as we departed the Kerry Duck Club. Hunted the grasslands today, where teal are king. I generally consider myself a mallard hunter, but today I officially became a teal hunter too. The greenwings came at us from three o’clock and they came at us from nine o’clock. The came in slow and landed. They screamed in like fighter jets. They came in by ones, twos, threes and fifties. Some times we just waved at them with our gun barrels without firing a shot. It was involuntary. We killed twelve teal and two widgeon today, my blind partner Tom and I. 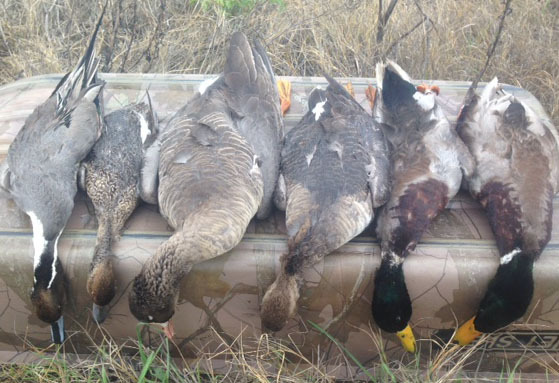 It took 45 shots between us – two for the widgeon and 43 for the twelve teal. We stopped briefly after we had ten birds and considered waiting for pintail. But, today teal were king. Today we finished early – and followed up with steak and eggs. OK duck lovers. Here’s the scoop on the green head I shot on Sunday morning. I was sitting on my bucket near the northeast corner of our property when he came into range as I grunted at him softly by mouth. He had his wings set and glided right into me from the northeast when I stood and fired. He was hit, but turned to his right and sailed across the center ditch hitting the water about 75 yards away from my makeshift blind. I headed to the north road go around the ditch, but Lola found the bird when I was about three-quarters of the way there. He was DOA. Shortly thereafter I saw the band. I turned and headed back towards the blind carrying the mallard. Almost back to the blind, I looked up and four specs came out of the fog. They flew directly overhead. As I had put the shotgun sling over my shoulder, I made a mad effort to pull the gun over my head. The first three specs were too far past me for a shot, but the fourth was still in range. Pow-miss, pow-miss. Now he was out there, but my follow-up prayer shot crunched him and he fell dead on the road – once again in the neighborhood of 75 yards away. I set the mallard down in the water and made it to the road in time to see Lola licking the goose. If the shot didn’t kill him, the fall did, because he had a broken neck and was stone dead. 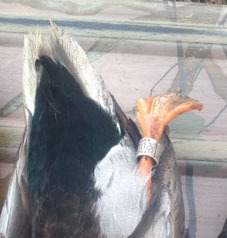 Subsequently, I have learned that the mallard was banded last summer near Los Banos. Fairbanks would have been sexier, but at his tender age, he should prime for eating. Sorry about the hen sprig. It was a case of friendly fire. 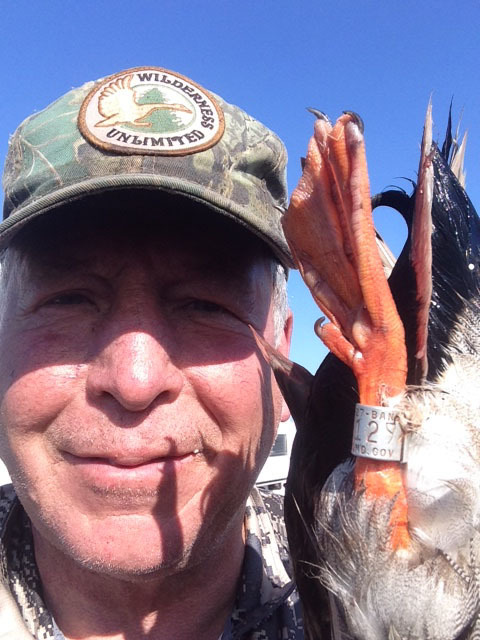 January has been a good month for waterfowl hunting in the grasslands and the delta. With ten days left, I hope to get in three more hunts. God willing, I’ll be in the delta this weekend and the grasslands on Wednesday. During the middle of the day. Rafts of ducks draw pintail away from our decoys. At the Kerry Duck Club the game has been numbers of ducks. Teal and pintail have been my primary target. 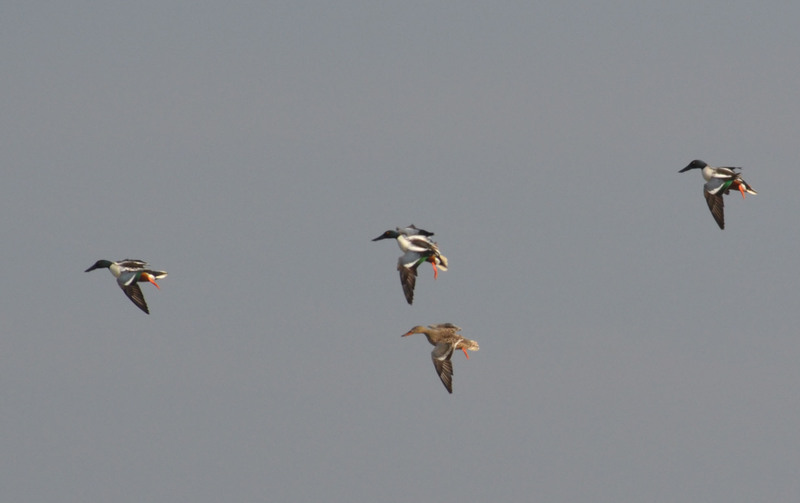 Some hunters are adding widgeon and spoonies. Last Saturday, while hunting with my friend Fred, we limited, but expended quite a few shells in the effort. Water levels have remained shallow which is very attractive to wading birds and dabblers. These black-necked stilts are standing tall. 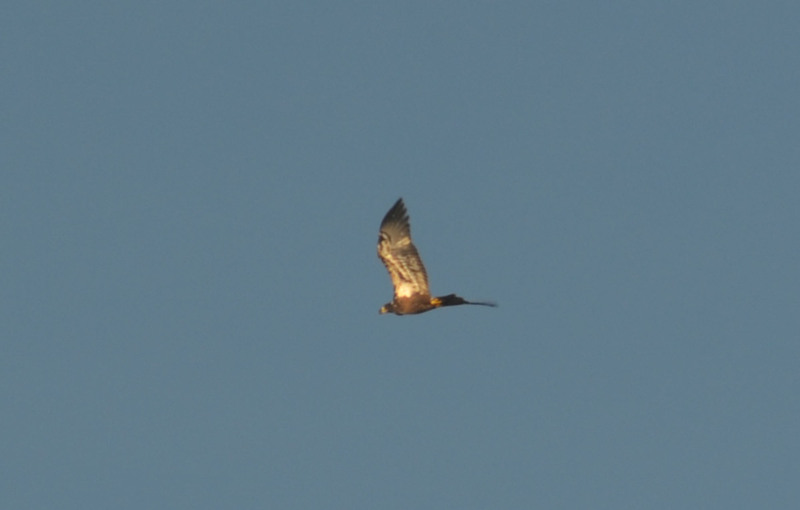 An immature bald eagle passes over. Click to enlarge. Ducks and geese are plentiful in the delta as well, but not as accessible. Large rafts of pintail and white-front geese are visible, but they tend to stay in their safe havens and avoid our blinds. But, we are bringing home specs and pintails with regularity. Specs are the goose of choice in the delta, but snows are found along side them in pasture land. These geese were resting at Sherman Island last week. Our hunting area is sand hills and ponds. The white-fronts are using the seasonal ponds, which makes them vulnerable while snows are hanging in the pasture land. On Wednesday, my partner Tom and I brought home a pair of specs apiece. 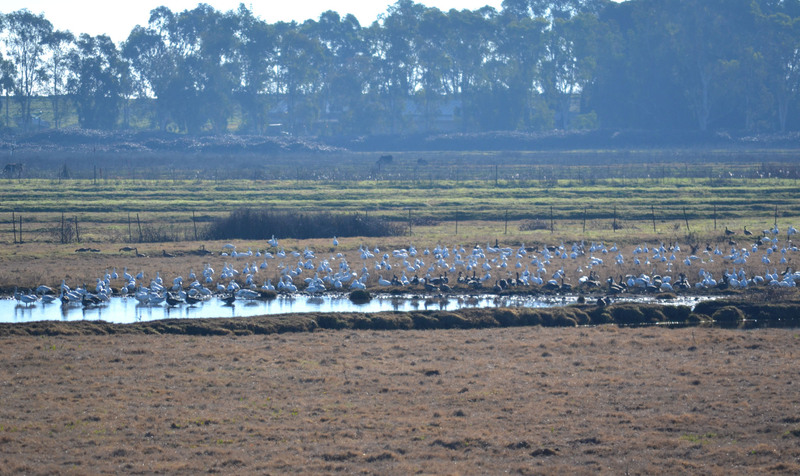 At the KDC, shovellers tempt us as we wait patiently for pintails to make a mistake.